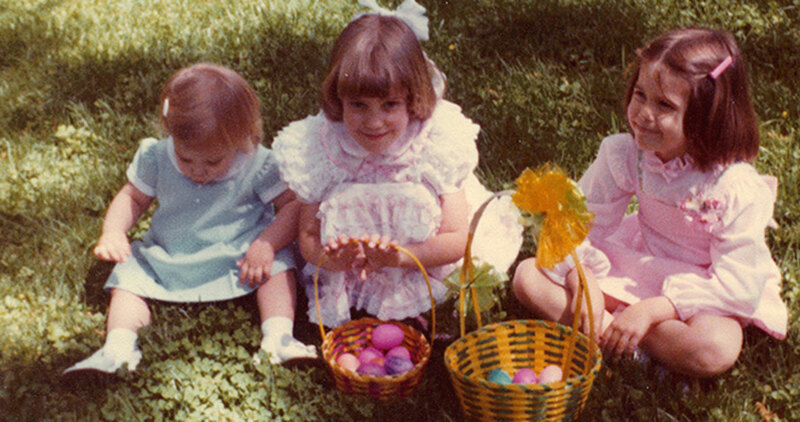 Hope Yancey’s memorable childhood Easter baskets held more than just candy and eggs. EDITOR’S NOTE: This story was originally published in April 2014 and updated in March 2018. Cadbury Creme Eggs, Brach’s chewy marshmallow eggs with the hard pastel candy coating, jelly beans, hollow chocolate bunnies, small foil-wrapped solid chocolate eggs, and green coconut nests. These were a few of the traditional Easter candies of childhood, when I was growing up. They were among the treats that made their way into the baskets our mother, Ann, assembled for my sister, Judith, and me, setting them out on the living room tea table for us to find Easter morning. The baskets, our mother says, were the “first order of business” before we did anything else that day. She seldom resorted to the convenience of prepackaged Easter baskets, preferring instead to choose the contents and wrap the multicolored baskets herself. They brimmed with Easter grass and sparkled with a covering of colored cellophane that rustled as it was removed, festooned with a ribbon or bow at the top. We dyed our share of hard-boiled eggs and hid them in the yard, but the eggs in our baskets were the plastic variety. Usually, there was some other small gift other than the edibles. I think I remember socks one year. It would have been “out of character for her not to put something utilitarian in there,” Judith agrees in a recent phone conversation. But candy was clearly the centerpiece. In this undated photo Hope Yancey, left, and her sister, Judith, show off Easter dresses and corsages. Judith’s best basket memory is “the suspense of rifling through it and not knowing what would be in it.” That, and the Cadbury Creme Eggs. Even now, she proclaims them her all-time favorite candy, with their filling the color of egg albumen and yolk, surrounded by a milk chocolate shell. On occasion, we might receive sugar egg dioramas with miniature scenes of rabbits or ducks displayed inside. (Those, we enjoyed more as keepsakes than for consumption, and they lasted practically forever.) Like hungry rabbits in search of a tender patch of clover to nibble, we pawed through the Easter grass to find forgotten items hiding in the depths of the baskets. Recollections of the baskets blend with other Easter rituals, such as the delicate orchid corsages kept fresh in the refrigerator and then carefully pinned to the new dresses we chose. 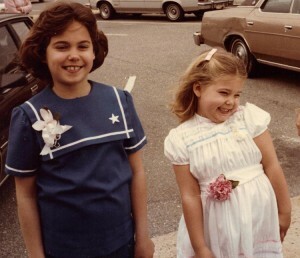 I wore a navy and white sailor dress one Easter long ago, its collar featuring white piping and stars. There were also egg hunts and Easter-themed birthday parties celebrated in April. The baskets, though, in my memory retain a fairy-tale charm. It wasn’t just the particular contents of the baskets that mattered most. The items that were included were not elaborate. Their presentation, and the fact that our mother took the time to pull it all together, made the difference. Somehow, the end result was always something greater than the sum of its parts.